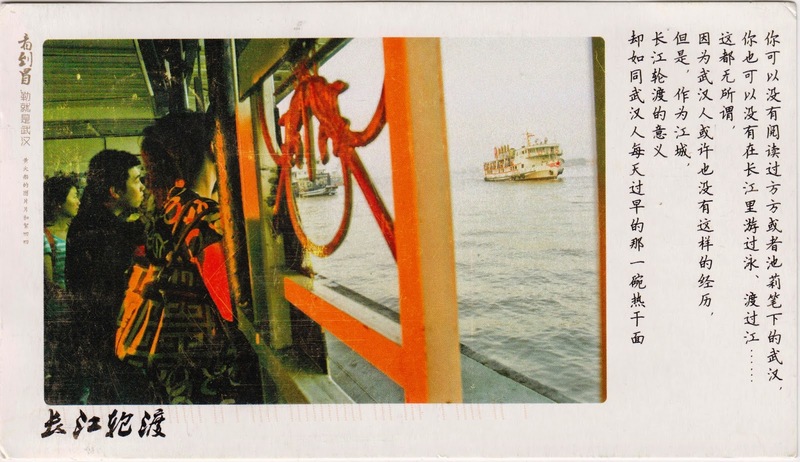 Postcard CN-1520549 from China shows people taking ferries to cross the Yangtze River in Wuhan, Hubei Province, China. Wuhan (武汉), the capital of Hubei province and the most populous city in Central China, is located at the intersection of the middle reaches of the Yangtze and Han rivers, consisting of the conglomeration of three cities, Wuchang, Hankou, and Hanyang. Those three cities face each other across the rivers and are now linked by bridges, including one of the first modern bridges in China. Ferries were the only transportation to cross the rivers before the Wuhan Yangtze Great Bridge opened in 1957. Even after the Metro Line 2, the first Metro line crossing through Yangtze River, opened on December 28, 2012, ferries remain a best choice for going directly across the Yangtze River since it's inexpensive and quick, and you can take your bicycle to the ferry for a nominal fee. In addition, it's a scenic ride to see the rivers and skylines of the three cities. Many ferry terminals for the more than dozen ferry lines are located by the Snake Hill in Wuchang where the Yellow Crane Tower (黄鹤楼), a historic tower first built in 223 A.D., overlooking the Yangtze River.